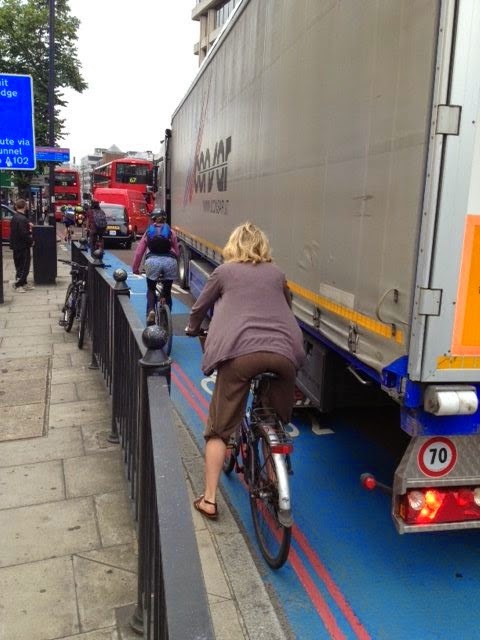 Cyclists in the City: Boris finally commits Cycle Super Highway plan to make bicycle as much part of the London street as a black cab or double decker bus. Minutes later - the black cab industry seeks judicial review to kill the scheme. Disgraceful. Boris finally commits Cycle Super Highway plan to make bicycle as much part of the London street as a black cab or double decker bus. Minutes later - the black cab industry seeks judicial review to kill the scheme. Disgraceful. It has been nearly four years in the making. And this morning, the Mayor finally threw his weight behind his planned "Crossrail for the Bike" - a commitment to build two protected "cycleways" running east-west and north-south through central London. This is a massive step forwards. 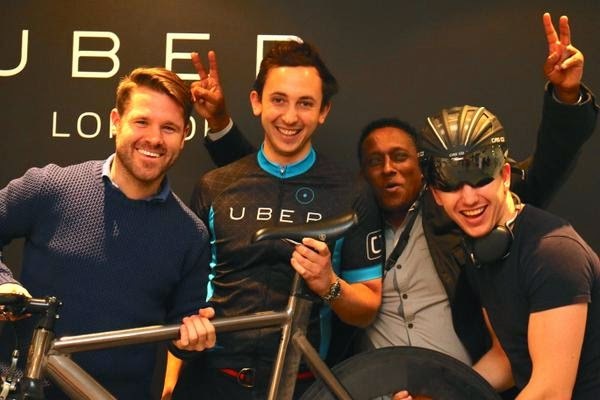 In my view, it will make the bicycle a central part of the way people travel around London, in just the same way as they get on a double decker bus or (for those who can still afford them) into a black cab. For the first time ever, London will have two clear, protected route for people cycling through the centre of the city. It is nothing short of scandalous that there isn't a single east-west bike route through London at the moment. These plans will go ahead more or less as proposed, albeit with a couple of amendments that will balance concerns from some parties about possible motor traffic congestion. Provided the board approves the plans at its meeting on 4th February, construction gets going in March. That, at least, was the plan at the start of this morning. Minutes after the announcement, the BBC announced that the Licensed Taxi Drivers Association would be seeking a judicial review of the plans. Funny, really, because people had been worrying that Canary Wharf would be the ones to come up with this ruse. Instead, it's been left to one branch of the black cab trade to deliver this sort of dirty work. The LTDA took to twitter earlier to insist that "the cycling minority are very over represented!" My understanding is that a judicial review could hold things up for many months. Worst case, it could even kill the scheme. The LTDA would be seeking a review of the process behind the consultation. Bear in mind that this is the largest consultation TfL has ever held and you'd have thought that the taxi association is on very very weak ground on this. But let's see. Sticking with what we do know, we can tell there are very few changes to the planned north-south cycleway (from Elephant to Farringdon). On the east-west route (from Tower Hill, along the Embankment, Parliament Square and up towardds Paddington), though, there are a number of amendments. 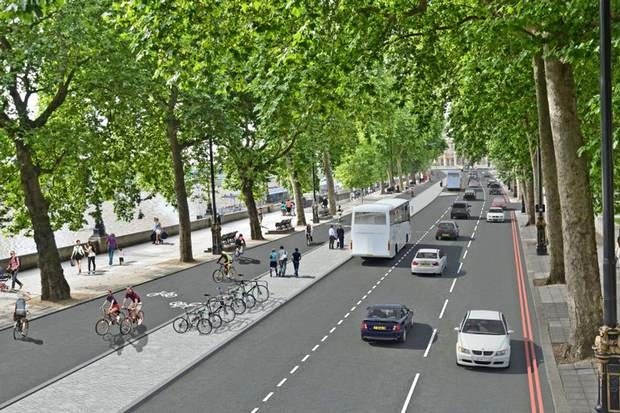 TfL's original proposal was to remove up to two motor traffic lanes at some points along the Embankment and create a four metre wide bi-directional cycle track. The track will be four metres in most places but will narrow to three metres (roughly the same width as the current Cycle Super Highway 3, as it heads along Cable Street) in some short stretches to allow TfL to retain an extra motor traffic lane. Is three metres ideal? No. Is it viable? Yes. There have had to be some compromises along the route but they are fairly short sections and if it takes a few compromises to get this thing built, well, my own view is build it. See how things change over time as more and more people start using the cycleway and pressure increases to make more space for cycle traffic. All in all, this is starting to become something really quite substantial. London is slowly going about building a network of routes along its main thoroughfares with meaningful space for people on bikes. My understanding is that the first section to be completed will be Oval to Pimlico over Vauxhall Bridge, which should be live and kicking by October this year .The other sections will take longer: For example, the new east-west route will mean, for the first time, a simple way through Lancaster Gate, a horrid four to five lane double roundabout that is a massive barrier to cycling. Building this sort of stuff takes time. But if things go to plan, all these routes will be in the ground by late next year. And it is well overdue. The original Cycle Super Highway programme, launched by the Mayor when he first came to office, was nothing short of a scandal. Vast amounts of money were spent painting blue lines on major trunk roads that provided almost no tangible benefit to anyone other than the consultants and contractors who worked on them. According to TfL, in the 18 months to December 2014 alone, seven cyclists died on these and other roads proposed to be upgraded in the superhighway programme. That's just not good enough. It is not for nothing that the Chief Executives of all London's major trauma and A&E centres have publicly supported the Cycle Super Highway plans. The black cab industry has now put itself in direct opposition to London's hospitals. Not a responsible thing to be doing, I'd suggest. 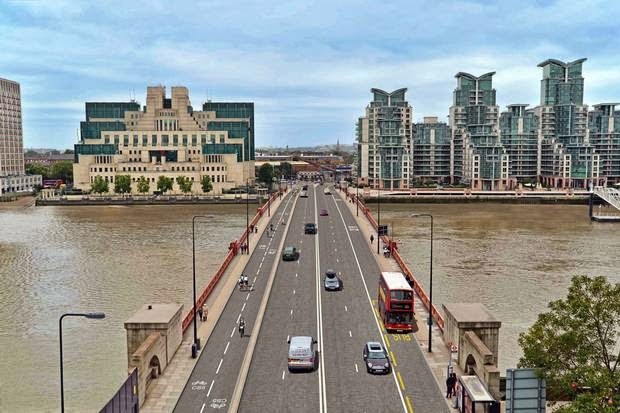 TfL's board will also be voting next week to approve two more schemes - Cycle Super Highway 5 from Oval and over Vauxhall Bridge and also Cycle Super Highway 1 from Tottenham down to the City. The latter scheme hasn't gone to public consultation yet but is up for approval in advance and is already being vetted by relevant local authorities. From what I can understand, the LTDA's problem is with only one of these schemes - the East-West route along the Embankment. Why particularly that route and not any of the others, gosh only knows. But I can't help noticing that Canary Wharf Group was also hugely opposed to this one route yet silent on all the others. A connection, perhaps? For years, the Mayor insisted his original Cycle Super Highways were a great idea. Notoriously, he insisted that the Elephant & Castle roundabout - where there have been 123 serious collisions in the last three years, half of which involved cyclists or pedestrians - was "fine" if you "kept your wits about you". Eventually, the message has got through. Massive multi-lane road systems designed to favour motor traffic rather than people traffic are not "fine". These places have to change to allow the majority of people to use them on an equal footing with the minority of people in motor vehicles. That means creating safe, convenient routes through them on a bike. And it seems to me that the Mayor has finally understood this message. The wheels have finally been set in motion. Thousands of people took part in the consultation, in support of these schemes. Over 130 CEOs of major London businesses wrote to the Mayor to urge him to go ahead - big names like Orange, the Financial Times, most of London's major law firms, some of its banks, plenty of other big household brands like Unilever, Microsoft and CocaCola. In other words, there is a massive swell of support for these schemes. And then there are a few organisations that want to bully the schemes into non-existence. My bet is the LTDA will lose its attempt at a judicial review. More importantly, though, I think people need to show the LTDA they are out of step with what people want London to become. Piece by piece, London is going to turn into a city where most people can use a bike, in the same way that most people can take the bus. That has to be a good thing.